Paris in February. Hmm, it doesn’t have quite the same ring as ‘Paris in the Springtime’, but February is when the fashion élite swan – or maybe totter – around the city of lights, modelling the “must haves, dahling” for Autumn/Winter 2014. And the news from le tout Paris in February was good for us here at DufflecoatsUK. Why? Because of the pink. Any fashion blogger worth their salt was raving about the season’s ‘key shade’ which was pink, and more specifically, pink coats. And actually, it didn’t just stop at pink, as models and fashionistas were also loving baby blue coats and camel winter coats. Can we tell you a secret? We did a few cartwheels in the office that day. Because although the – whisper it – fickle fashion world decided that pink is ‘in’ this winter, at DufflecoatsUK we play a more traditional fashion game, and we know that pink is always ‘in’ for those who like to add colour to the drab hues of winter. And so is baby blue. As for camel-coloured coats? Well have they ever gone out of fashion? So after the excitement of February, here we are at the start of Autumn 2014 and it’s time to start looking for a coat. And by that we mean, it’s time to look for a duffle coat. Well, we would say that wouldn’t we? The good news is, if you’re looking for a pink winter coat, we can oblige. And if it’s a pale blue winter coat or camel duffle coat that you’re after? Walk this way. First up, our pale pink short duffle coat. The delicate pink hue of the outer fabric is complimented by the soft lilac and taupe picked out in the traditional checked lining. As with all of our duffle coats, the pink duffle coat is hand made in England using traditional weaving methods that bind the outer coat to the inner lining. This creates the trademark thickness of a British duffle coat. The slimming fit of our pink duffle coat makes it an ever-popular choice (not just when the fashion police say it’s ok to wear a pink winter coat!) and the shorter length is preferred by some of our customers as it makes the duffle less bulky than a longer coat. As you might expect, our baby blue short duffle coat has all the same characteristics of our pink duffle coat, including the trademark ‘pancake hood’ (so-called because it lies flat on the shoulders of the coat) and leather loop fastenings with buffalo horn toggles. If you’re looking for a long duffle coat that still gives a nod to this season’s trend of pastel hues, our long pale blue duffle may well have your name on it. With its rich wool content – 70% wool, 30% polyesters – our knee-length duffle coat is thick, heavy and designed to keep you toasty while keeping up with this season’s pastel trend. It’s all very well for the fashionistas to talk about ‘rocking’ a ‘look’, but back in the real world, you might not feel ready to head to Waitrose in a pastel pink duffle coat. So for those who prefer a timeless shade, we have a range of camel-coloured duffle coats. Our short and long duffle coats are both available in camel and our luxurious, mid-length London duffle coat is also a popular choice. With a slightly higher wool content than our other duffles – 80% wool and 20% mixed fibres – the London duffle is one of our warmest winter coats. So what’s it to be? Are you all about the pink this season, more pastel blue or playing it safe with camel? Whichever colour you’re after, now is the time to buy as our sale is still on. So you can look stylish, stay warm and not pay Fashion Week prices. Brilliant. 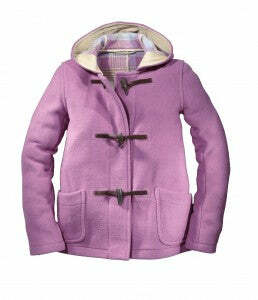 See our pink duffle coat. See our baby blue short duffle coat. See our baby blue long duffle coat. Play it safe with our camel duffle coats.